(ZIZ)– The St. Kitts Mother’s Union visited the Cardin Home Sunday morning as part of their ongoing outreach programme. The Mother’s Union membership prepared and served lunch to the residents and also made other donations to the home. 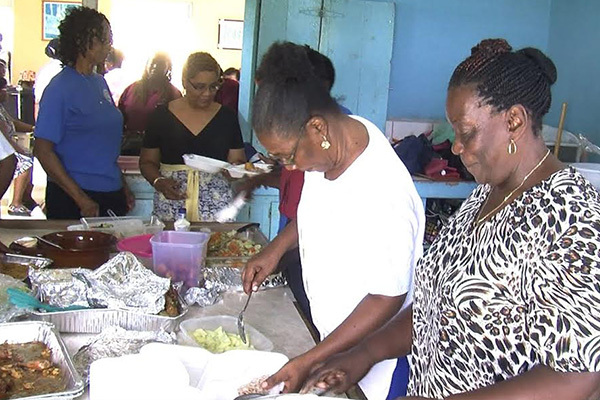 Sunday was recognized internationally as Mothering Sunday wherever there is a mother’s union, explained the organization’s Island Council President, Veronica Liburd. She said the activity was undertaken annually in keeping with the occasion. “Today is what we call Mothering Sunday. It is celebrated throughout the world where there is a Mother’s Union and that is the fourth Sunday in Lent. So as our outreach programme, we do lunch at The Cardin Home. [We] share and fellowship with the inmates,” she said. Mrs. Liburd continued that the visit went very well. She said that in addition to serving the meal, a donation of grooming implements was made to the home for use by the male residents. “Oh it went very well! Each year we would ask them, you know, ‘What can we donate?’ So this year they asked us for a shaver for the men to help with their grooming,” she said.